A walk linking one of the most beautiful and historic towns in the South East with one of the best beaches in the region, using the track of an old tramway. A great walk any time, but particularly on a sunny day. 4 miles / 6.4 km, 1hr 20 minutes, flat. A small amount of walking on loose sand. Trains run hourly to Rye from Lewes and also Ashford, Hastings, Eastbourne and Brighton. Numerous in both Rye and Camber- but with very different styles. If you want organic locally grown ciabatta with seasonal salsa hand picked by specially trained fair trade Columbian peasants then it has to be Rye. For fish and chips and an ice lolly it really should be Camber. Outside Rye railway station, in the park just before the Rother bridge at Rye, in Camber central car park. Cross the road using the crossing. Turn left on the pavement and then immediately right on a path which runs between the bowling green and the toilets. When you pass the toilets head diagonally left towards the far corner of the park. 2)Arrive at a main road. Bear right to cross the road bridge. Immediately after the bridge turn right and descend a slope to a footpath. There are two routes here. The one you want runs straight along the side of the buildings. B)This was the site of Rye Tramway station. The company could not afford to build a bridge to get nearer the town, but painted a big sign saying “Tram Station” on the roof of the station to attract potential passengers. Walk along straight path till you come to a bridge. The tramway ran slightly to your right. As you cross the foot bridge you can see the remains of the old tramway bridge on your right. 4)At the end of an embankment pass through a gate and turn immediately right. You are now back on the route of the tramway. In 2013 you could still see the 3ft gauge rails at some points. Continue straight ahead on a concrete track, with the rails sometimes still embedded in the concrete. C) You arrive at Golf Links station. Continue ahead (making train noises if you wish) and walk between the golf course fence and a large building on your right. After the building, keep the fence on your left until you come to a kissing gate. with a sign giving information about the tramway above the gate) Go through the gate and turn right on the old railway embankment (less than a metre high) Shortly afterwards there is a junction where a route goes off to your right. Ignore this and continue to bear left on the embankment. This is a permissive route, which means that the golf club allows you to walk it, but has the right to change their mind. The route is established, so there does not seem to be a threat of this happening. The route is way-marked by a series of posts which make it easier to follow. D)Dunes close in on your left and ahead and you come to a point near the edge of the course where you must bear right and cross a fairway. Camber station was somewhere around here. The tramway company boasted that it was “far from the madding crowd” and passengers must have been surprised to find themselves here. Originally this area was part of the dunes. The golf course has been extended as the sea has retreated. Cross the fairway carefully and walk ahead to a kissing gate at the edge of the golf course. Go through the gate and follow the path, which goes to the left and then joins a path that runs left and right. 5)The main route goes right here. But it is also possible to end the walk by turning left. You quickly come to a large car park. On the other side of the car park is a road. Turn right along this road and you will come to bus stops. The stop for Rye is on the right hand side of the road. The stop for Dover is on the left. If you are following the main route you will find that you path peters out at the point where the dunes start to rise. It does not matter very much which route you follow, so long as you keep in the same general direction. You quickly come to the beach. This is a quieter part of the beach. If you like things quiet you may want to sit here and then use the alternative route above to return. To your right things get even quieter and the dunes are beloved of naturists and courting couples. Bathing on the beach near to the jetty at the far end of the beach can be dangerous. The walk continues to the left here, along the beach, until you reach a large café right next to the beach. Leave the beach by the café. Walk down the left hand side of the car park. Go out of the car park entrance. To the right you will see a sandy track between bungalows. 6)You emerge from this onto the main road and the bus stops. The stop for Dover is on the opposite side of the road. The stop for Rye is on the same side. 6) Get off of the bus at Camber post office and stores. Take the sandy track which starts next to the post office. At the end of the track turn left and walk across the car park towards the café. Walk onto the beach and turn right. As you walk along the beach your will see large boards with letters on. These are to designate particular areas of the beach. Walk to the board showing “B”. Turn right at this board and walk into the dunes. There is no designated path but, in summer at least, you can follow the footsteps in the sand. When you get to the top of the dunes you see a path in front of you. Take this. 5)After about 50 metres you will see a path going off to the left. Take this. Pass through a kissing gate. You are now on the golf course. Bear right, following the signs. Carefully cross a fairway and follow the signs to your left, in front of the dunes. Camber station was somewhere around here. The tramway company boasted that it was “far from the madding crowd” and passengers must have been surprised to find themselves here. Originally this area was part of the dunes. The golf course has been extended as the sea has retreated. The path is initially in a small cutting, and then bears slightly right, heading for a shelter, which you can see in front of you. Pass the shelter, keeping it on your right. You will see a low embankment in front of you. This is the route of the tramway. Walk along this. Towards the edge of the golf course you come to a fence and then a kissing gate on your left. Go through the kissing gate and keep the fence on your right. Pass between a house on your left and the fence. The station is remarkably preserved. The golf club have undertaken to keep it in its current condition. You can see the tracks of the old line. The concrete was added in the 1939-45 war, after the line had closed. You may want to make a diversion to your right to look at Rye Harbour across the river. Sadly there is no ferry these days . Continue straight ahead on a tarmac and concrete road which is built on the track of the tramway. 4)Where the road turns right keep going straight ahead and the then turn left along a raised embankment. When the embankment turns right at the river follow it round and walk for about a kilometre to a junction with a track, near a gate and building. Turn right here along the track. 3)Where the track turns right you will see a stile on your left. Cross this. Turn left along the track. Cross a bridge. The tramway ran slightly to the left of the path. As you cross the bridge you can see the remains of the old tramway bridge on your right. Walk straight along the track to the point at which it meets the road. 2)Turn left and cross the road bridge. After the road bridge bear left across the park, following a footpath sign and aiming at a point just beyond the playground to your left, between the toilets and the bowling green. Pass between the green and the toilets and walk along an tarmac path to the road. Cross the road at the lights and walk up a footpath ahead, which takes you uphill to the town. Turn left at the top and walk along the High Street until you get to Market Road on your right. Walk down Market Road. Cross the road at the bottom and walk in the same direction to the railway station, which you can see in front of you. There is a café at the station if you have to wait for a train. There is a popular market on Thursdays. Buses into Rye in the mornings and out in the afternoons may be crowded. Your route does not explore Rye, but if you have not visited it before, it would be a shame not to explore this ancient and beautifully preserved town. Its features include a heritage centre and tourist office (A) by the quayside, the Ypres tower, built to defend the town against the French, the church of St Mary, dating from 1150 and with a tower that you can sometimes climb to see the views and a number of historic buildings. Your route passes by Landgate, and ancient gate to the town. You can download a map of the town here. Walkers of a certain age may find the town familiar. It was the setting for many of the Captain Pugwash stories as author John Ryan lived in the town. Younger walkers can make his acquaintance here. Other recent residents include the pop duo the Cheeky Girls, originally from Transylvania, whose big hit “Cheeky Song” was written by their mother. 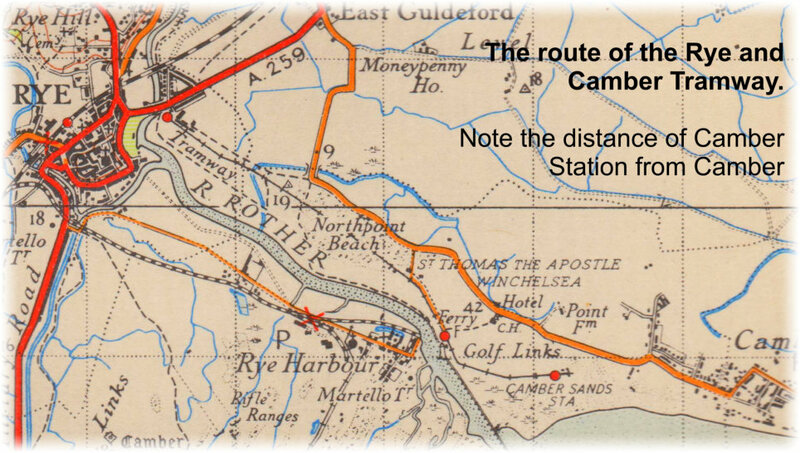 Really more of a narrow gauge light railway than a tramway, the Rye and Camber Tramway was opened at the end of the 19th century, mainly to transport golfers from Rye to the Golf course near Camber. Almost as an afterthought it was extended towards Camber beach, although it never quite got to the main part of Camber. As golfers acquired cars, they became less fond of their tramway and became more hostile towards its incursions into the course. However it survived until the 1939-45 war, when it played an important part in the sea defence of the area. This is resulted in it being in such a state that it never opened to the public again after the war. The definitive guide to the line is “the Rye and Camber Tramway” published by Plateway Press. Adams of Rye, at the eastern end of the High Street, sell a shorter pamphlet. If you are interested in walking old railways you may be interested in “Vintner’s Railway Gazeteer”, which is a comprehensive list of old railways that you can walk on. You may also be interested in Railway Ramblers, an organisation for railway walkers. Certainly the best sandy beach in East Sussex, and one of the best beaches in south east England, the vast sandy stretches and dunes of Camber Sands make Camber an attractive destination. Only a small proportion of the beach is built up and, except on the busiest days, it is easy to escape the crowds. However on a hot bank holiday there will be lots of people. The buses may also be crowded. Camber village has always been downmarket, although the Ciabatta set are being attracted by an increase in articles in style magazines about boutique bed and breakfasts.